In 1964, the historian Richard Hofstadter published an essay titled 'The Paranoid Style in American Politics' in 'Harper's Magazine', and maybe that set it all in motion. "In recent years we have seen angry minds at work mainly among extreme right-wingers," Hofstadter wrote. "But behind this I believe there is a style of mind that is far from new and that is not necessarily right-wing. Conservatives weren't pleased with the diagnosis, and they were perhaps even less pleased with being coolly diagnosed. "Hofstadter dismissed conservatives as victims of character flaws and psychological disorders - a 'paranoid style' of politics rooted in 'status anxiety,' etc," my colleague George Will remarked in a reproachful 2008 column. "Conservatism," he said, "rose on a tide of votes cast by people irritated by the liberalism of condescension." If that's true, then Hofstadter's observation about a trend in conservative rhetoric may have inadvertently helped to breed another one to join it - the triggering style in American politics. First, an example. 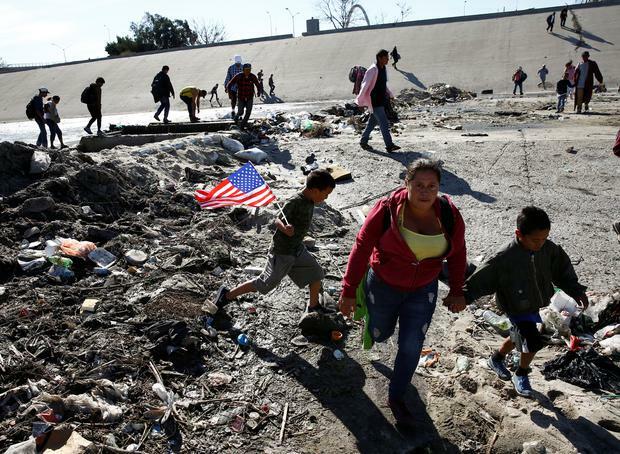 When the now-famous Reuters photograph by Kim Kyung-Hoon of a mother and children fleeing tear gas at the San Ysidro point of entry appeared online last Sunday, liberals quickly began sharing it along with demands for humane treatment of migrants at the US border with Mexico. Some conservatives adopted what Hofstadter would doubtlessly characterise as the paranoid style, arguing the photo had been intentionally selected to misrepresent the situation at the border. Others argued that, pitiful as the depicted events were, they were necessary and not all that different from those used in the Obama era. And a third set celebrated the photo, hamming up their delight with tweets like "I've found my Christmas card photo. #Caring," and "Watching the USA FINALLY defend our borders was the HIGHLIGHT of my Thanksgiving weekend." The last exemplifies the triggering style. It isn't really about convincing anyone of anything; it's a rhetorical method that speaks to the other side, but without interest in persuasion. Indeed, the triggering style doesn't even aim to reinforce onlooking conservatives' views that liberals are wrong. Instead, it attempts to shatter that calm, intellectual satisfaction that annoyed Will and earned Barack Obama such wide conservative resentment. By intentionally trying to cause liberals maximum emotional upset, the triggering style strives to compromise liberals' most valued attributes: placid objectivity, moral certainty, intellectual strength, powers of analysis capable of responding to opposing political viewpoints. You're just screaming and yelling and calling names, now, the triggering style says, you're no better than what you say I am. In 'The Atlantic', Adam Serwer speculated that, for many of President Donald Trump's most dedicated followers, cruelty against people they already despise is the reason for their support, not an unfortunate, unavoidable side effect. And that's reason enough to nod along with Trump and cast another vote for him. But the exaggerated, highly publicised display of such pleasure seems like another effort altogether, one that is related to the victims of Trump's policies but only incidentally, one that's really about liberals and their tears, as the kitsch coffee mugs advertise.